WEB community for english speakers cooks and japanese food suppliers. (cooks, pâtissiers, sommeliers, food bloggers). Here are list of fine japanese foods listed in CROSS FOODS. You can order japanese food samples directly from the suppliers in Japan. We, japanese suppliers don’t know well the suitable recipes for your country. So japanese suppliers wish to know your impression for their foods, how to make fine recipes to find the possibility to sell well in your country, communicating directly with you with the aid of english-japanese translation. Japanese suppliers charge its fee, so you can communicate with japanese suppliers online all for free. We’ll introduce your restaurants in japanese language to japanese people who want to visit your country and your restaurant and who are interested in the menus in your country. 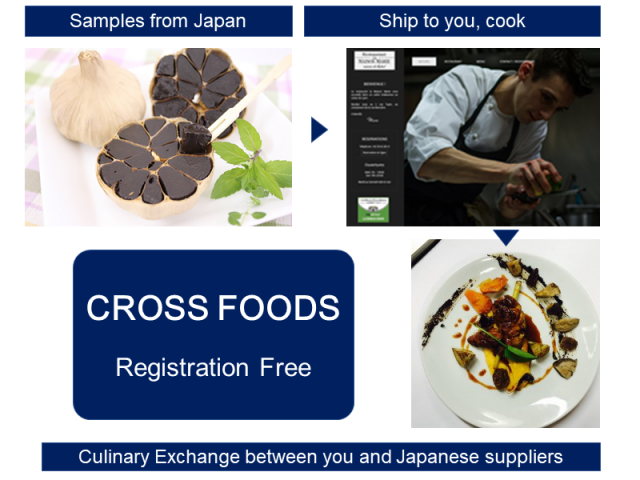 You can contact us, if you want to get the foods directly from japanese suppliers, which are not yet listed in CROSS FOODS.